The content of this topic has been archived between 29 Mar 2018 and 30 Apr 2018. There are no obvious gaps in this topic, but there may still be some posts missing at the end. As I didn't see any topic mentioning this nice little piece of hardware, I decided to create my own. 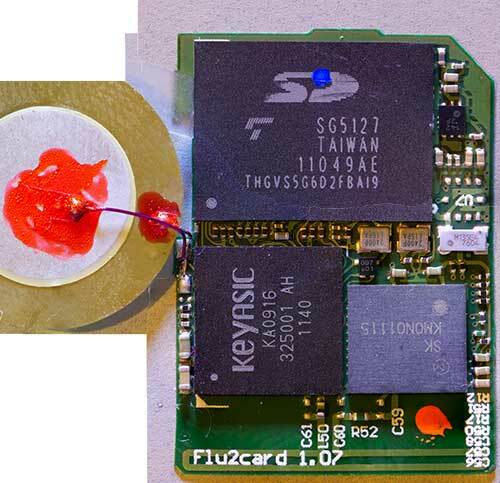 ka2000_sdhc: module license 'Proprietary' taints kernel. 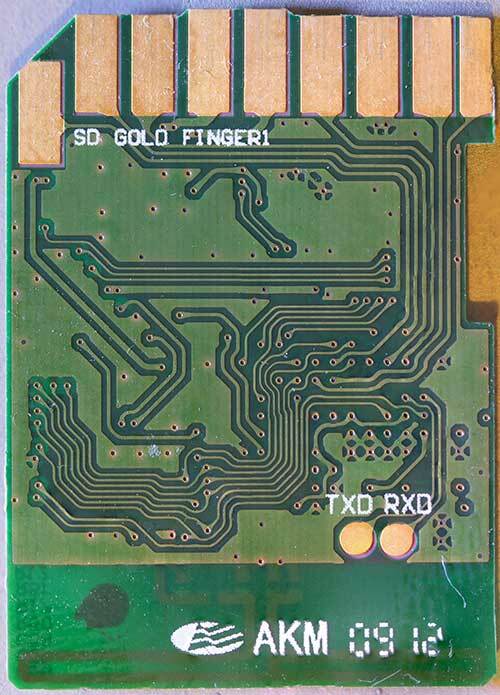 mlan0     AR6000 802.11g  ESSID:""  Nickname:""
I circumvented this by adding a solder bridge within the SD slot R/W detection pin on the SD reader given by Transcend. You can of course add the other busybox applets. I updated to firmware 1.7 (shipped as 1.6), wich reseted my settings but didn't wipe my data from the sd part. The 1.7 version supports raw files natively (cr2, srw, rwl, rw2, raw, pef, nrw, nef, kdc, k25, dcr, srf, sr2, arw, orf). I extracted the lastest 1.7 firmware files and am in the process of reading through it. 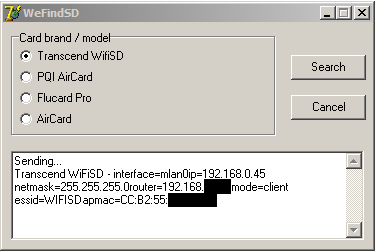 There are several mention of "FLUCARD" within the WifiSD firmware. The two devices are clearly linked now (before we "only" knew they shared the same hardware). Very interested in all this... Please keep us updated! Though there is no u-boot.bin in the official 1.7 firmware release. Thanks to the serial console (detailed on chapter III) you have access to the card bootloader. Press any key after the start of the boot sequence in the console to stop it (you have something like 3 seconds after the KeyAsic Booloader). This booloader (KA Boot 04240806) lives in the SoC ROM. It works lika a stage 1 and its duty is (among other things) to call program.bin (like a stage 2) as, how we saw in chapter II, is based on U-Boot. 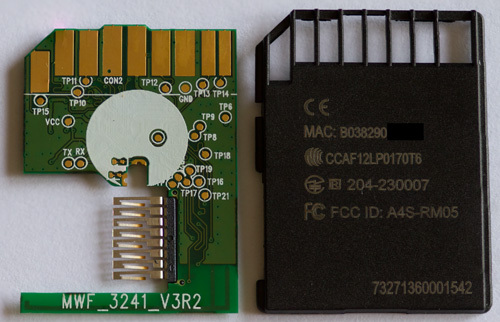 Has anyone figured out a way to get one of these to boot in a stand-alone fashion, only connected to a 3.3V power supply? I have a PQI Aircard and thought I read somewhere of some success making it boot standalone. My card doesn't seem to boot (no Wifi anyway) when it is inserted in a SD Card breakout board (Parallax 32313). With the 16 GB MicroSD card installed it takes about 31 mA. Interestingly when the MicroSD card is pulled it, the devices takes around 90 mA for a few seconds before settling to a constant 66 mA current consumption. But still no wifi. I haven't cut it open yet and attached wires to the serial port. That will probably tell something. I have seen no successful description of a stand-alone (without a full, running, SD host) setup. I tried connecting the 3.3V & GND pin to a stable supply with no luck. 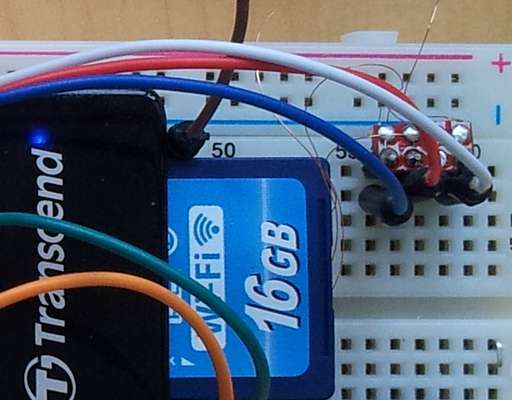 I also tried powering an external USB SD-Card reader (5V & GND) and it didn't even light up. I didn't try a SPI-mode host yet, it might be our best chance to get a running WifiSD/PQI Air/FluCard with minimal hardware. I don't know about any "light" setup which would init one bit or four-bit mode, but didn't do any research on that. Maybe a simple bit-banged init sequence would be enough ? I have PQI Air card busybox and Linux kernel sorce. if you need, you can easy DL following address. this is DropBox. 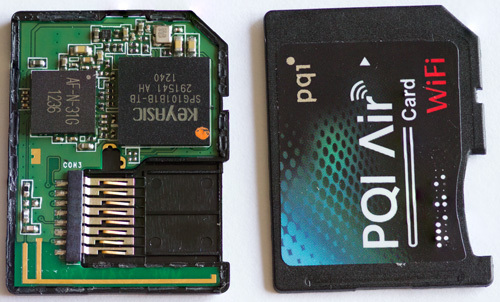 Aircard firm: PQI original firmware. Inotify: AIrcard linux image with inotify fs. 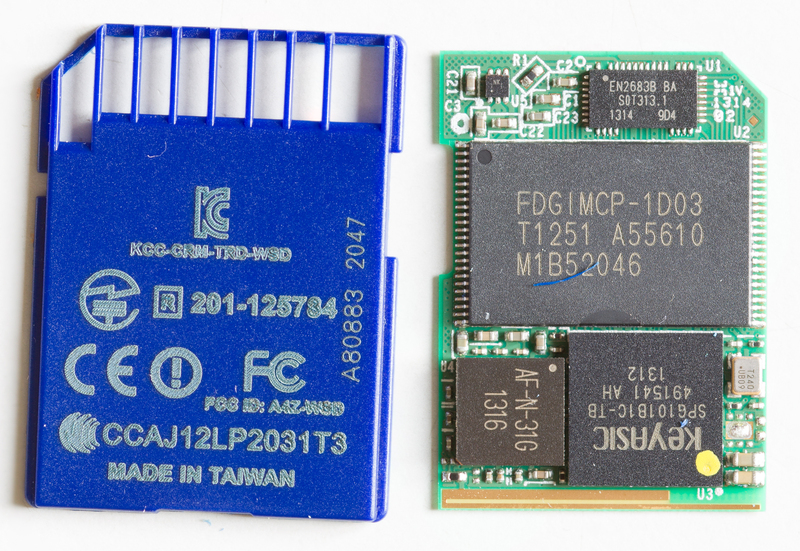 PQI_Configs: i get from PQI TAIWAN(PQI is Taiwan company), Busybox and Linux configs. busybox_KA_20130702.tar.bz2: this is with out boa server. busybox-1.18.5.tar.gz: This is original PQI Aircard Busybox source file. 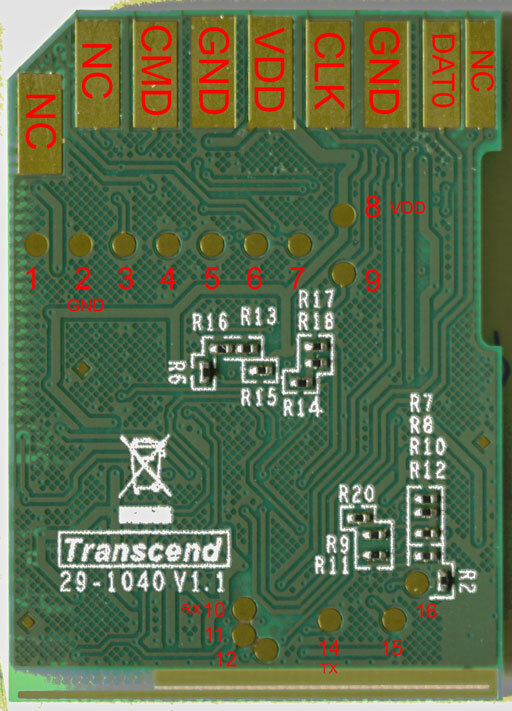 KA_SDIO_SD_EVB_Manual_v03.pdf: KeyASIC base bord manuals. Linux_KA_2_6_20130702.tar.bz2: This is Original Linux source. u-boot source code is waiting from PQI. 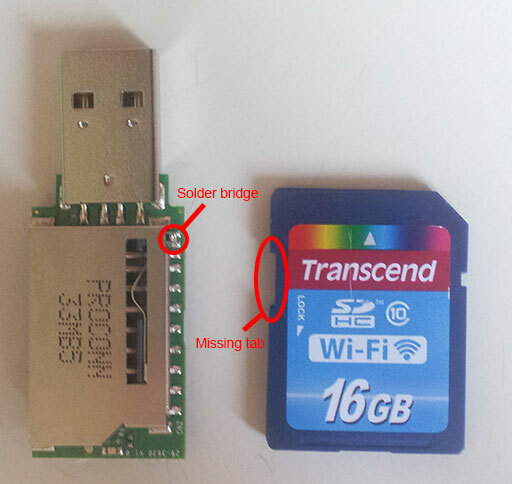 I think just like any wifi-SDcard devices. All devices use the Key-ASIC solution. If, fruitful information with you. I am so happy. Woaw, what a leap forward ! Thank you ! Tested only with my Transcend WifiSD so far. for me it looks like rxd is on pad 10 and txd is on pad 14. Thank you for your find ! I'll try that and modify the picture accordingly. Any though about the other pins' assignment ? Repetitively broadcasts ARP request on the entire subnet, ie. This seemed to repeat even after the connection from the app to the air card was established, of course it did not re-request the address of the known air card. I was connecting WiFi phone to WiFi Air Card, so unable to sniff the packets to see what everyone responded with and what actions the phone app took upon receiving a response. 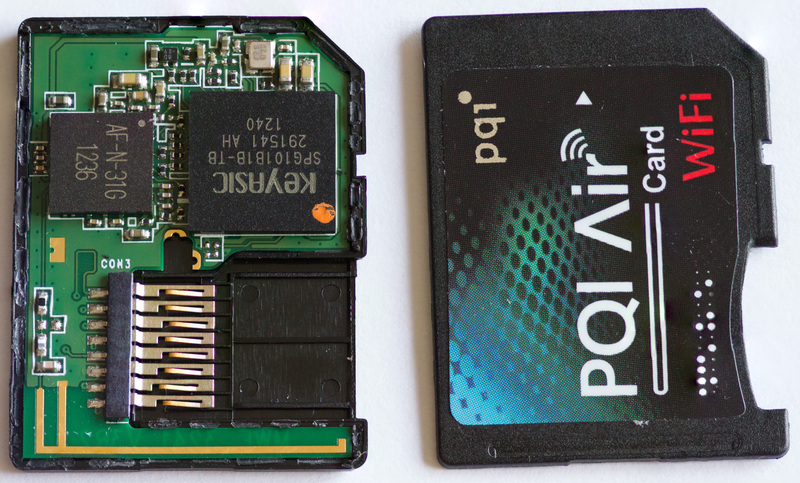 I have a PQI Air Card and I would like to know if there's any progress on OpenWRT being ported or any other distros either? [01/Jan/2012:00:00:05 +0000] boa: server built Feb 25 2013 at 15:18:57.
sdio wakeuplo        no wireless extensions. my soldering skills aren't that great so I only manage to get the connection some times, enough to get the same-ish boot time log. [01/Jan/2012:00:00:05 +0000] boa: server built Apr 17 2013 at 18:28:52. That discovery method is indeed not very elegant. I ordered an AirCard, will try to find an alternative discovery once I receive my packet. how does your setup look like. 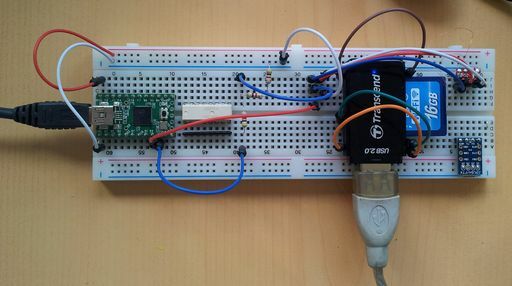 I used a USB/Serial 3.3V board (in fact 3 of them, only one worked), but now I'm using your solution (with a teensy 2.0) and it now works every time, thank you. Are you able to send anything with the console after the boot sequence ? I can't. I used 0.1mm enamel coated wires to be able to close the SD while piping through the RX/TX/GND. Not my best job, but it seems my soldering wasn't at fault after all. Which answers with the full configuration stored in wsd.conf (and passwords in plaintext). The default firmware on the WifiSD is far from perfect, but it's better by any metric.